If you love heart-shaped compact mirrors, consider using them for wedding favors. These hearty favors make a great choice for any heart themed wedding or classic romance theme. Heart-shaped compact mirrors are inexpensive and readily available online. You can personalize your heart mirror favors transforming them into great wedding keepsakes. Search almost any online wedding store and you are sure to find yourself a number of heart and love theme related favors. Show your wedding guests appreciation by choosing a lovely mirror compact that will slip easily into an overnight bag or purse. Having a large guest list does not mean that you must have a favor budget to match. Instead, take advantage of comparison shopping websites and find the best deals available. Buying in bulk at one time can also help reduce the cost of your favors. 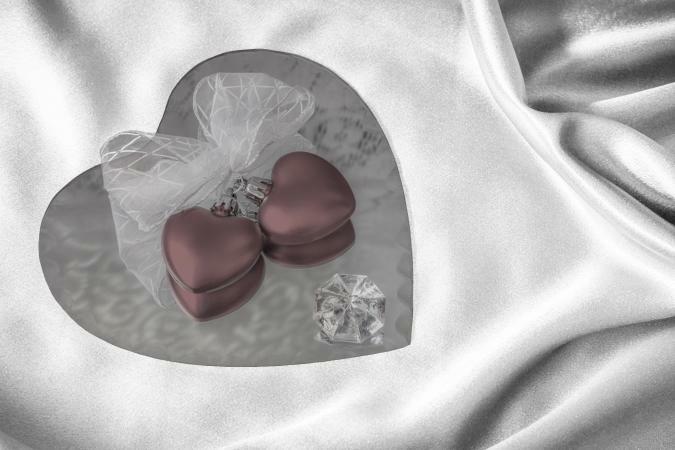 Another option for buying your heart mirror favors online is to buy from a retailer where you plan to do other shopping. While you may not get the cheapest price, you could qualify for a percentage off your total, free shipping, or other free gifts. Take this into consideration before purchasing your mirror wedding favors. Heart-Shaped Mirrors - These six-inch heart-shaped mirrors could be the start of unique favors you make yourself. Chrome Heart Mirror - Get this stylish mirror shaped like a heart enclosed in a black pouch. Check into local engraving stores for a discount, as this could end up being cheaper than ordering online. If you like the idea of engraved mirror heart favors but do not have the money to buy one for your entire guest list, consider getting the bulk ones for guest favors and buy engraved mirrors as bridesmaid gifts. If you bought heart mirrors without a pouch, package them in a wedding favor box and add ribbon to tie the tag on. Place them at each table setting at your reception or underneath each name card holder near the seating chart. Give bridesmaid jewelry in heart shapes, like necklaces and earrings. Have pew decorations in the shape of hearts. Include a song like One Hand, One Heart in the ceremony. Get a heart-shaped wedding cake. Have a wedding cake topper with a heart on your round, square, or heart-shaped cake. Dance to I Cross My Heart as the first dance wedding song. Wear a garter with a heart on it. Wedding reception centerpieces could include heart candles or topiaries in the shape of a heart. A love and heart themed wedding is perfect around Valentine's Day or for a couple who wants a romantic feel to their wedding. Love heart mirror wedding favors, romantic music, and heart-shaped decorations can all enhance that theme.